Fujifilm has announced its new 10 megapixel digital camera – Fujifilm FinePix Z35, which comes with conspicuous design and trend-setting style. The new Fujifilm FinePix Z35 is equipped with 2.5-inch LCD screen, 10 megapixel CCD sensor, 18 MB of internal memory which can expanded with the SD card and Fujinon 3x zoom lens. In addition, FinePix Z35 also features Picture Stabilization Mode, Face Detection, ISO up to 1600, Blog Mode, Fujifilm’s Scene Recognition Auto (SR Auto) technology, Micro Thumbnail View and support VGA video recording with 640 x 480 pixel resolution at 30fps in AVI format. 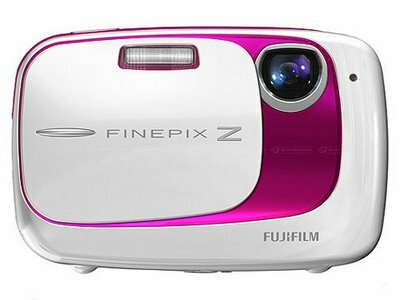 The new Fujifilm FinePix Z35 digital camera is available in five colors: Marshmallow White & Pink, Quartz Black & Silver, Apple Green, True Blue and Deep Purple. The Fujifilm FinePix Z35 measures just 23.9 mm thickness and weighs 100 grams. It will be available in the UK starting from September 2009 with pricing to be announced nearer to the date of the launch.